A+ Worley Striping Inc. has been serving you for more than 30 years and has a highly knowledgeable staff that does every job right the first time. We use durable, oil-based paint that lasts longer than other materials, and we provide efficient services while still taking the time to make sure every line turns out just right. 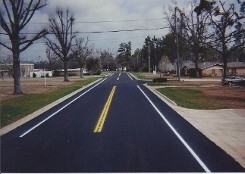 In addition to pavement striping, our crew provides sign and wheel stop installation and power washing. Sign installation makes traffic instructions clear to drivers, and power washing makes sure that your pavement always looks its best. A+ Worley Striping, Inc., is a professional pavement striping and parking lot maintenance company based in Tyler, TX, that designs and paints pavement markers. We also do sign installation and power washing for commercial customers in the East Texas area. Find out why we're the right choice for pavement striping by contacting us in North East Texas, to ask for a free estimate.